Red Dirt Rug, Rena Detrixhe. 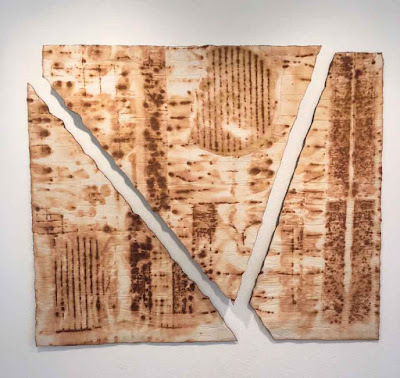 earth, 96' x 72" x 5"
The refining and sifting of the soil and the imprinting of the pattern is a meditation on this past, a gesture of sensitivity and a desire for understanding. It is a meticulous and solitary act. .. . The form of the rug, from a western perspective, is an object of luxury; it is a symbol of authority and power. For the maker it is an expression of beauty and often cultural significance, the result of many hours of careful labor. 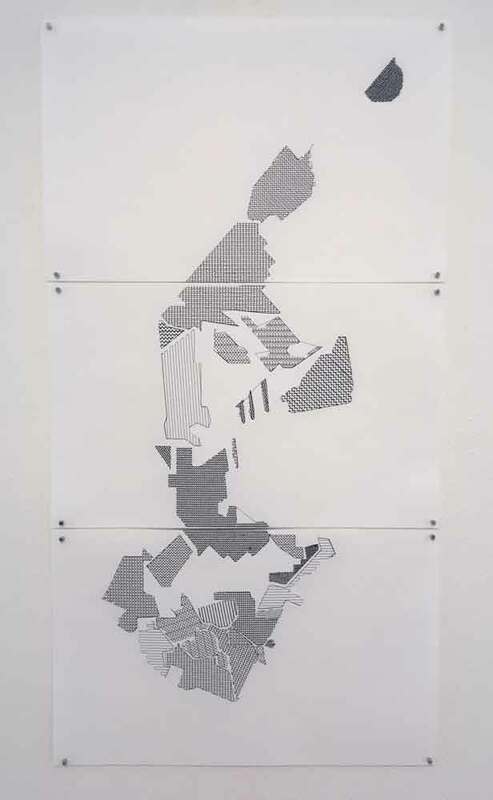 Through this form, I contemplate the tension between nature and human impact while suggesting the ubiquitousness and preciousness of the earth just below our feet. This reference to "meticulous and solitary. 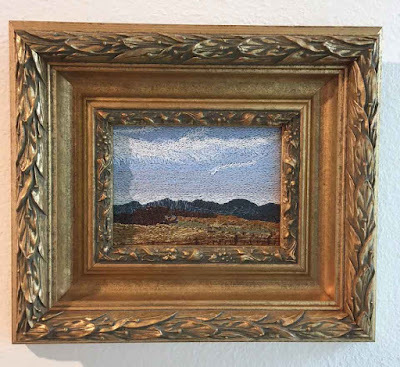 . . hours of careful labor" helped me to see that this piece, though it contains no fiber and uses no textile techniques at all, belongs in this show as a kind of conceptual weaving. 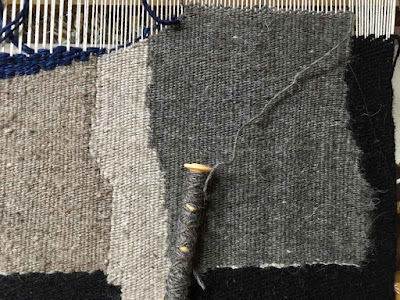 It's a fresh and thoughtful response to the function, history and traditional patterning of rugs. It flips the exquisitely crafted luxury item and status symbol on its head. 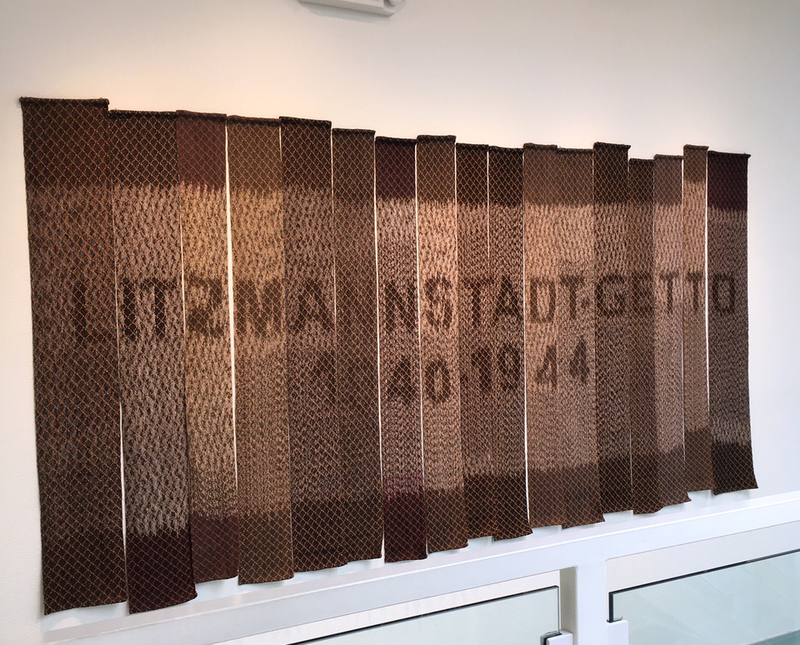 A more traditional weaving spoke to a very specific place, the Litzmannstadt, or Lodz, ghetto in Poland during World War II. From this site Jews from all over Europe were deported to concentration camps. 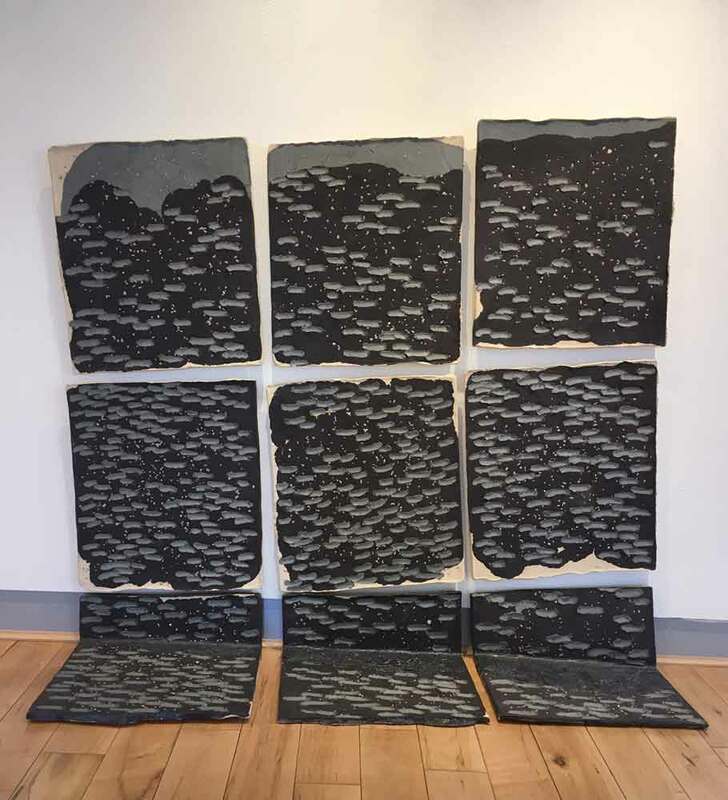 Wendy Weiss based her image on a photograph of a commemorative granite marker. 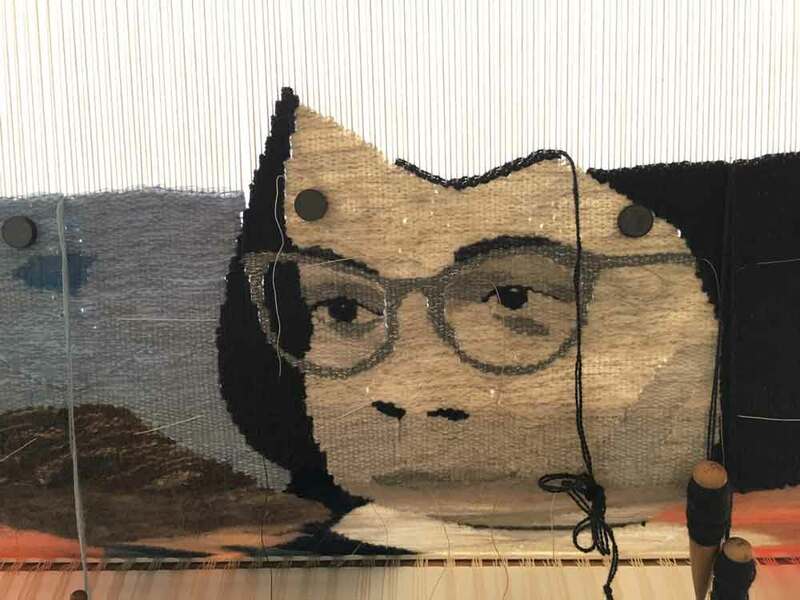 She effectively uses Jacquard weaving (I believe) to create a piece that evokes imprisonment. For me the separate strips suggest a kind of fence, as does the diamond patterning. There is no taking comfort in the softness of this material. Wendy Weiss, Litzmannstadt Getto, 1940-1944, weaving, 53" x 111"
detail, Wendy Weiss, Litzmannstadt Getto, 1940-1944, weaving, 53" x 111"
I liked this piece better the more I looked at it. 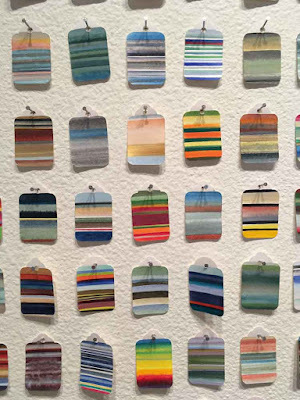 Each paper tag or label, all 638 of them, was colored with watercolor and ink. 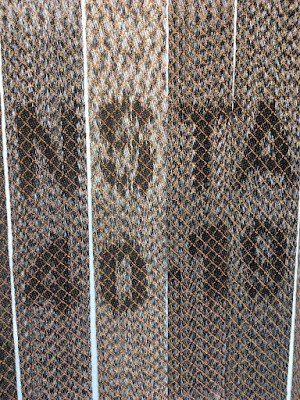 Its connection to weaving and fiber is tenuous (though paper is technically a fiber), but in this case the grid format, the color, and the implied elements of labor over time made for me an interesting conceptual connection for me with weaving. 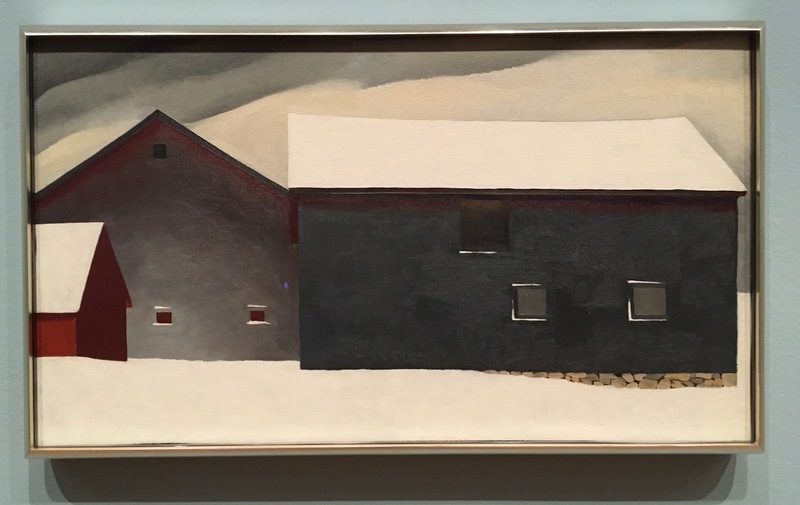 The connection to place is perhaps implied by the colors and the horizontal lines; the title suggests this is more of an internal landscape. 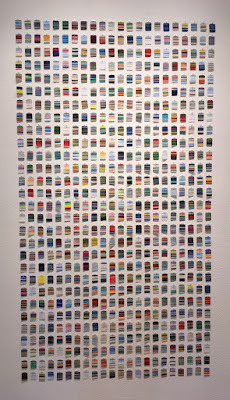 638 watercolor and ink drawings on paper, 56" x 33"
In the field of embroidery, there was one piece that might be called "straight" or traditional. 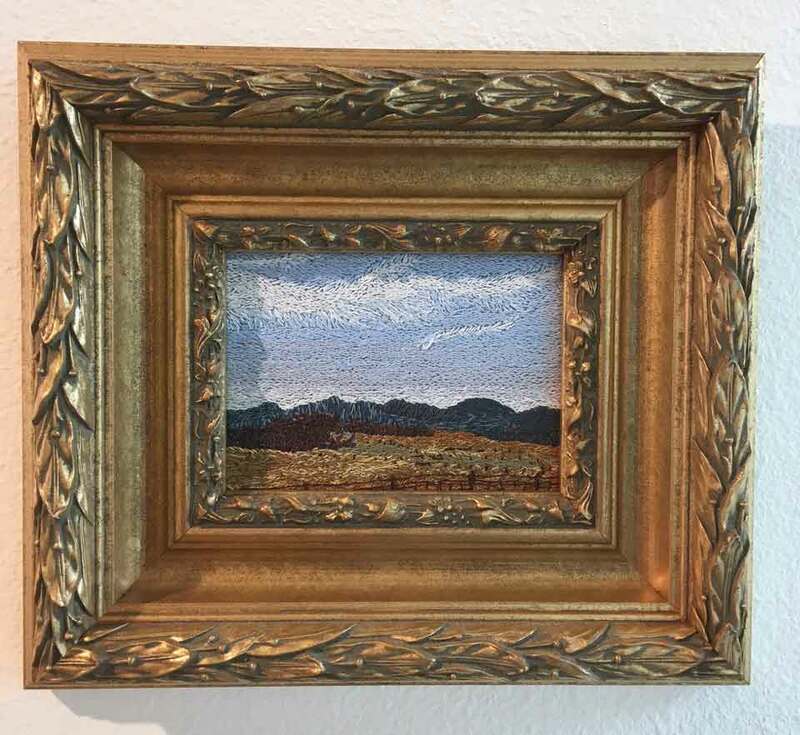 Mandy Remmen, Blue Mountains, embroidery, 10" x 11.5" x 1.75"
At first glance, a familiar scene of hills under a blue sky, presented in a very traditional gilt frame, seemed almost quaint in the context of other, edgier work in the show. But closer inspection shows a boldness and freedom to the stitching that belies the fussiness and prettiness of much conventional embroidery. The frame begins to seem like a ironic comment on the subject and the medium. 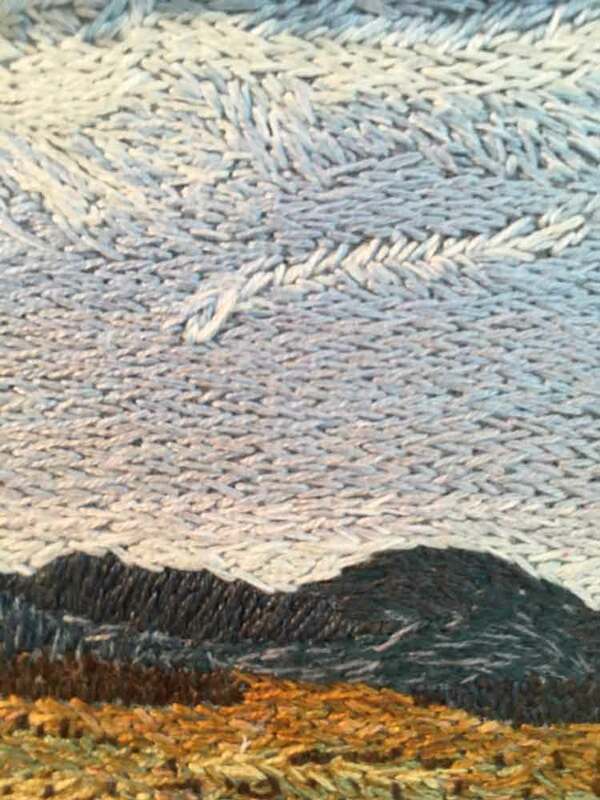 detail, Mandy Remmen, Blue Mountains, embroidery, 10" x 11.5" x 1.75"
Quiltmaking is undoubtedly one of the most popular fiber art forms today. 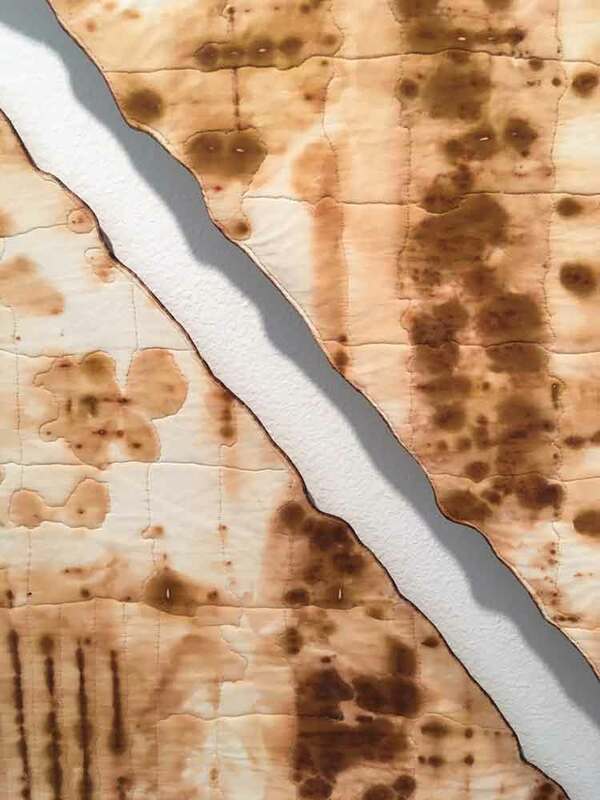 Artists are exploring a myriad of surface design techniques and materials to move quilting far beyond its utilitarian origins. 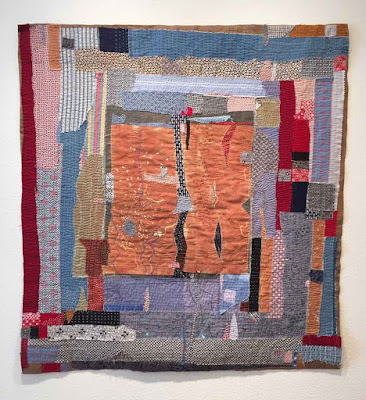 The quilts in this show represented several current trends in the art quilt world: embellishment, improvisational piecing, and rust-dyeing. 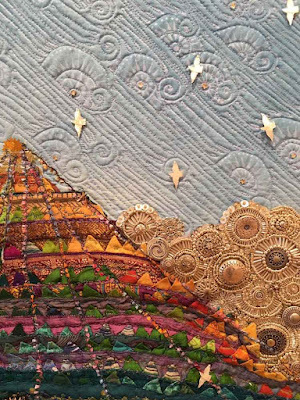 Melody Money, Sky Prayers, Memories of Sky, mixed-media textile, 59" x 41"
detail, Melody Money, Sky Prayers, Memories of Sky, mixed-media textile, 59" x 41"
The artist does convey a sense of a magical, sacred Eastern landscape in this piece. 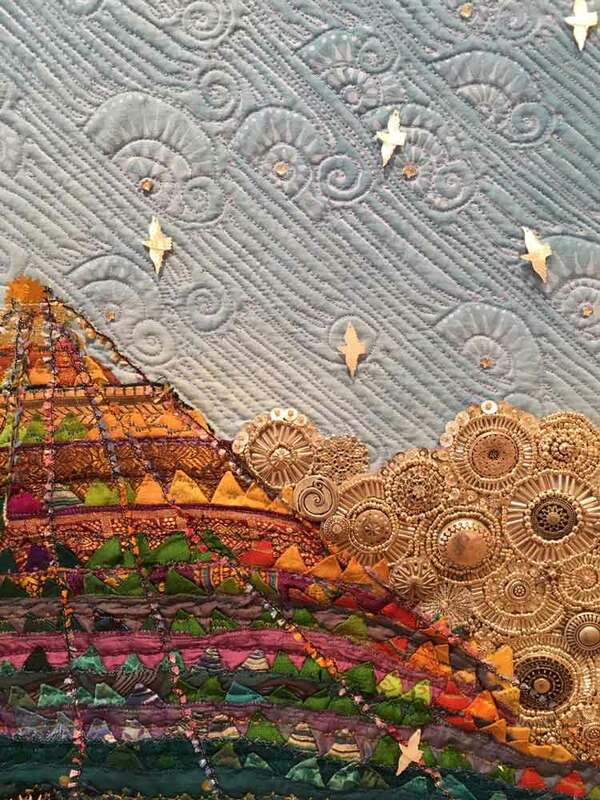 The quilting is exquisite. While technically impressive, this piece seems a bit overworked and over-embellished to me. 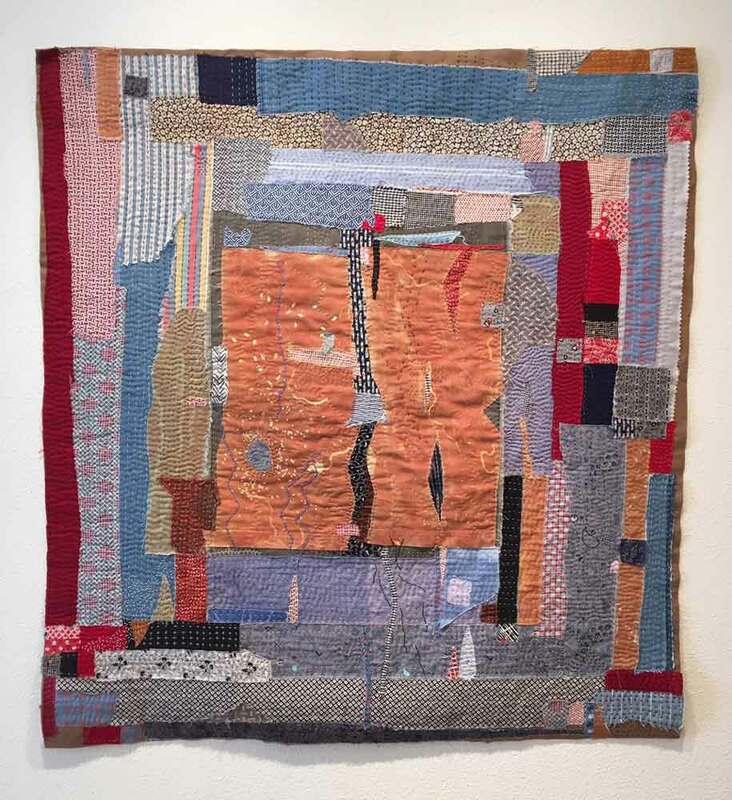 Patricia Kennedy-Zafred, A Dying Breed, fiber, art quilt, 44" x 44"
Regina Benson took an interesting approach to the quilt format, slicing the rectangle into three shards and mounting them as a relief on the wall. Regina Benson, V Restored Legacy, fiber, 42" x 46" x 3"
detail, Regina Benson, V Restored Legacy, fiber, 42" x 46" x 3"
I wonder if the title is a reference to the old iron tools, perhaps, that had been used to rust-dye the fabric. There is a sense of industrial decay, of a whole that has come apart here (a twist on the pieced quilt that makes a whole from fragments), that could be a comment on the future of our natural world. If you've made it this far, thank you for reading! Obviously my opinions are simply my own responses. You would likely respond differently to this work, and that is as it should be. Please share your comments below. 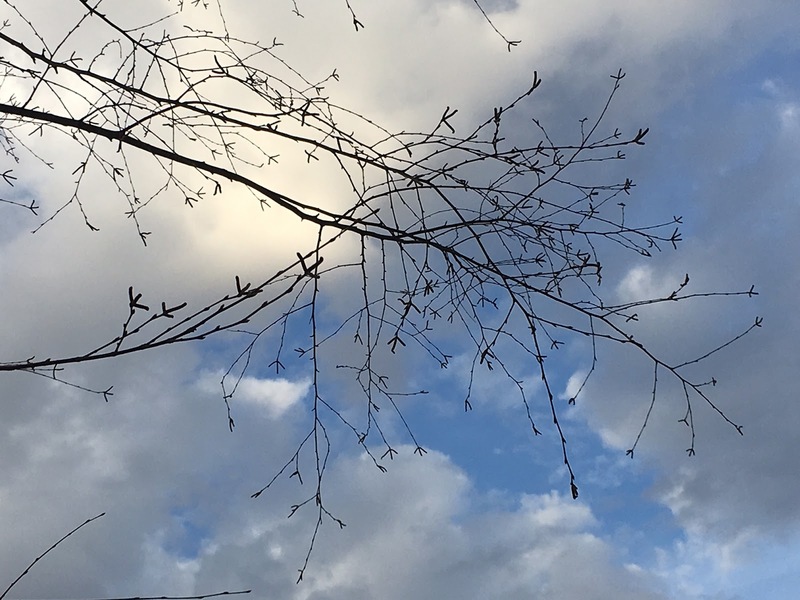 Let's engage in the critical conversation our fiber medium needs. 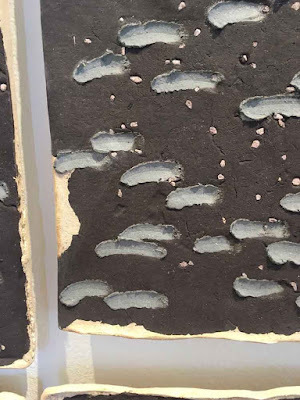 I was in Santa Fe last week and got a chance to view the 3rd International juried members' show of the Surface Design Association. The show, juried by Erika Lynn Hanson and Frank Rose, is at form & concept gallery through May 20. The show got under my skin enough that I went back to see it a second time, and I'm glad I did. In fact, there was so much to see and to ponder that this is the first of two posts about this show. All photographs are by me. Full disclosure: While I am a member of SDA I did not enter this show. 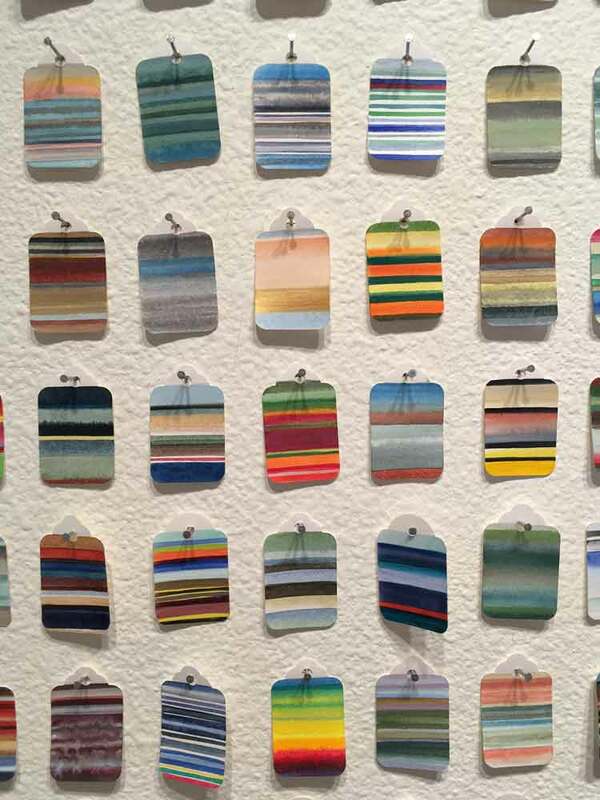 The Surface Design Association is one of the major organizations of fiber artists in the country. Surface design is, narrowly speaking, the patterning of cloth or paper. 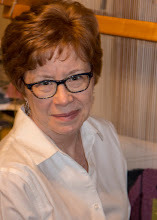 More broadly, the organization's purpose is to support "innovation in fiber, art and design." SDA publishes a beautiful quarterly, the Surface Design Journal, and sponsors conferences bringing together artists and academics in the field of fiber art. 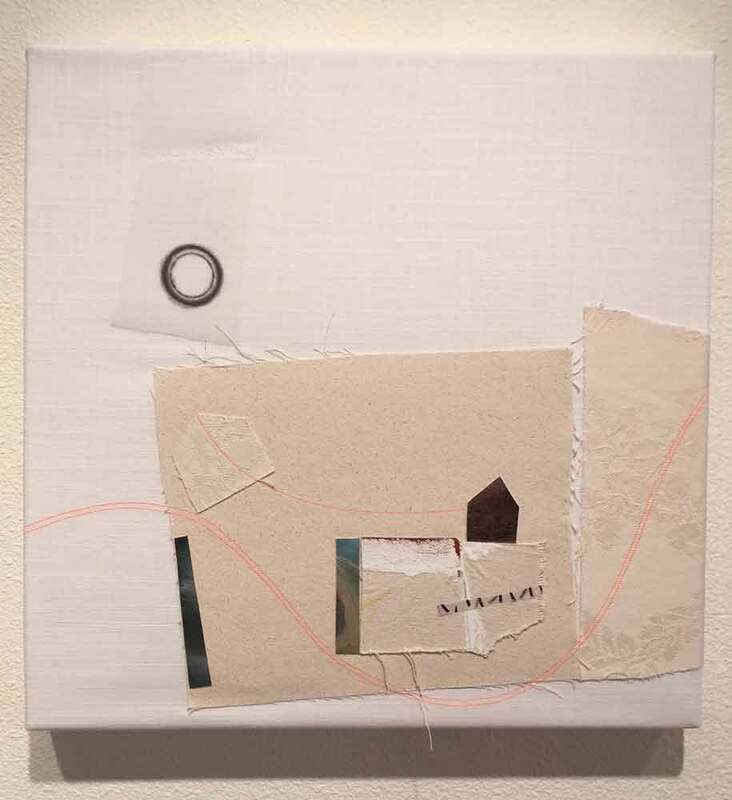 I was taken aback, then, to find in the show a number of works that did not utilize fiber at all. These included an installation of paper swatches, a video, three photographs identified as "hand-dyed silver prints," and a piece made of dirt. More about that later. Yuge Zhou, Soft Plots, video with sound. 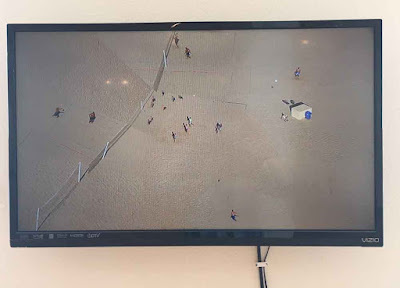 I confess: I find video generally unconvincing in the art context. Very few images on a screen have for me the power of something in which I can see the mark of the hand. I failed to see how this particular piece related either to the theme or to textiles. 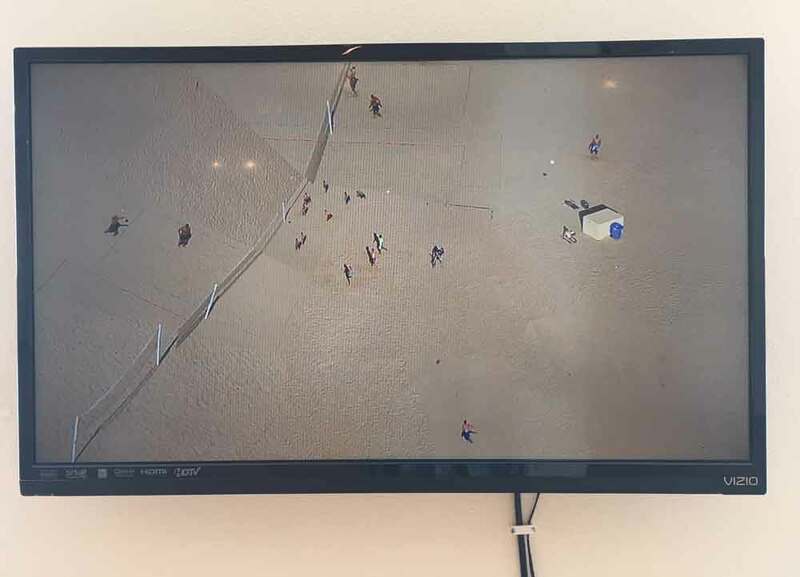 It did not help that the ambient music in the gallery totally drowned out any sound in the video. As an artist who loves to work with fiber, and who is well aware of the lack of respect in the wider art world for our medium and materials, I was dismayed--at first--that a flagship fiber organization would devote precious exhibit space to non-fiber work. 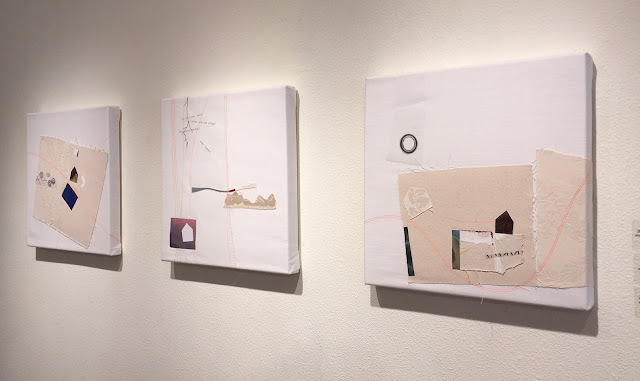 Conversation with the friendly gallery-sitter, and later checking of the SDA website, informed me that the show intended from the start to include "both traditional and non-traditional contemporary interpretations of place by makers working with or inspired by fiber or textile materials and techniques." Ah. "Inspired by." I'll come back to this notion. For now I want to look at how artists approached the theme of place, by now a well-worn theme in art and literature. digital drawing/embroidery on nonwoven paper, 66" x 13.5"
Other artists viewed landscape metaphorically, as an internal, emotional place. In this category I liked this series of three collages by Karen-Anne Glick best. 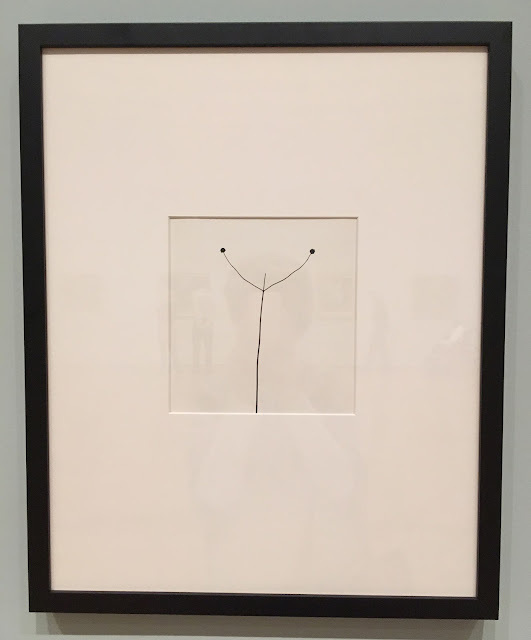 I enjoyed the artist's abstract and pared-down approach that made the most of subtle contrasts in texture, edge, and line. For me these pieces are evocative and poetic. set of three, mixed media textile, each 17" x 17"
Karen-Anne Glick, Ja Vi Elsker, mixed media textile, 17" x 17"
By far the most common, and to my eyes the most effective, approach to the theme was to sound a prophetic call: to focus on ways in which our human history is bound up with the earth's, and to indicate the future that awaits if we fail to take action on environmental issues. Barbara Shapiro wove and then dyed with indigo pieces of cloth that when mounted suggested to me the rising sea levels caused by climate change. Is this a city skyline, sinking? 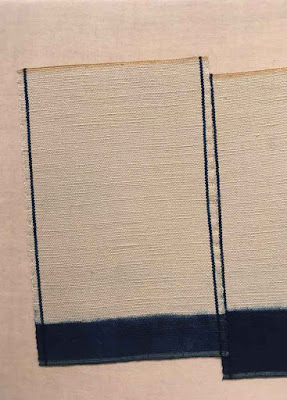 Barbara Shapiro, Sea Change, woven and dyed fabric, 24" x 62" x 1"
detail, Barbara Shapiro, Sea Change, woven and dyed fabric, 24" x 62" x 1"
It was interesting to compare Shapiro's piece with the one below on the same theme. Again there is the sense of changing water levels. Yewen Dong, Water is Fragile 2, paper clay, 57.5" x 52" x .5"
detail, Yewen Dong, Water is Fragile 2, paper clay, 57.5" x 52" x .5"
Remember the piece made of dirt I mentioned? 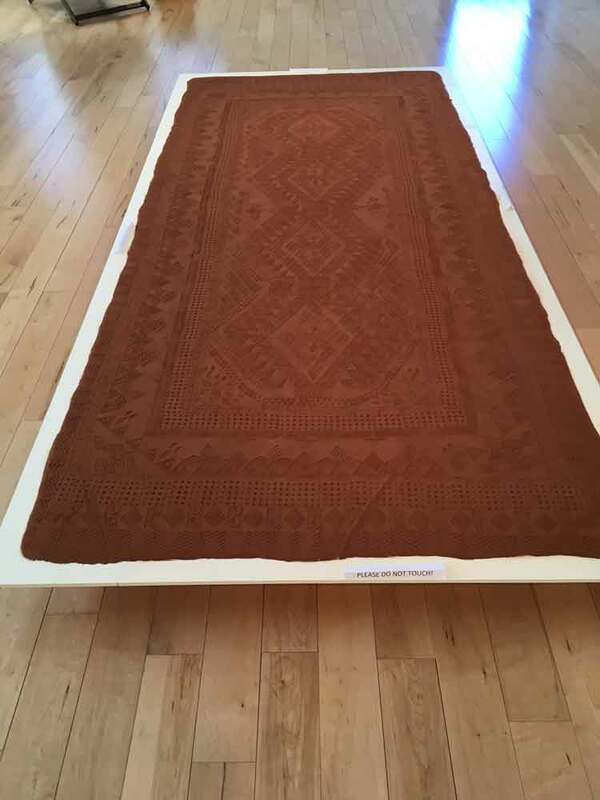 As it turned out, on second look, my absolute favorite piece in the exhibit was Red Dirt Rug by Rena Detrixhe of Oklahoma. My first response is Wow, how was that done? And then, of course, Why? Why emboss an ornate traditional rug pattern on or in a layer of dirt? It completely subverts the purpose of a rug--to cover and to decorate a bare floor. Sometimes we sweep dirt under a rug! Normally a rug with this kind of formal and traditional pattern is a precious luxury item. Wait. . . maybe that's the point. 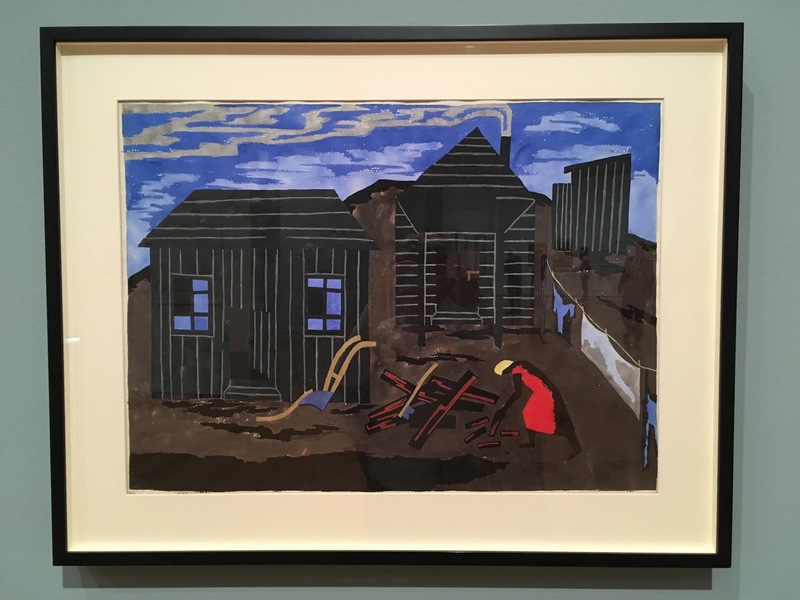 This rich red soil is the land of the dust bowl, the end of the trail of tears, of land runs and pipelines, deep fault-lines and hydraulic fracturing. There is immense beauty and pride in this place and also profound sorrow. 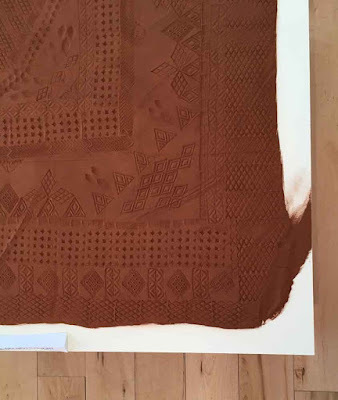 The refining and sifting of the soil and the imprinting of the pattern is a meditation on this past, a gesture of sensitivity and a desire for understanding. It is a meticulous and solitary act. detail, Red Dirt Rug, Rena Detrixhe. 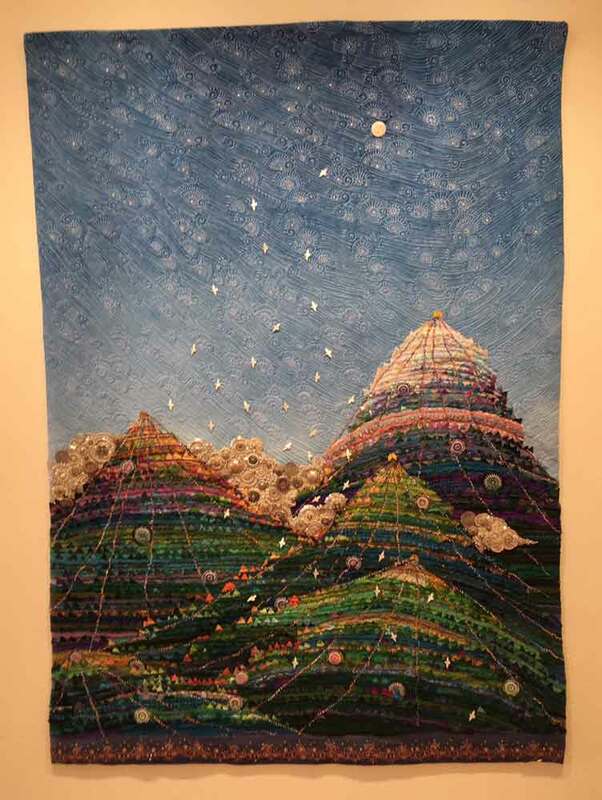 earth, 96' x 72" x 5"
I will come back to this piece in next week's post, when I consider the artists' approaches to specific mediums of weaving, embroidery, and quiltmaking. Right up there in my blog subtitle it says "thinking out loud." This post is one of those "thinking out loud" ones. Last weekend I saw the exhibit Cross Country: The Power of Place in American Art 1915-1950 at the High Museum here in Atlanta. It's a thoroughly enjoyable show for several reasons. First of all, there's lots to see--hundreds of pieces of painting and photography. It's organized by region rather than chronologically or by medium, so you see artists responding to the Southwest or the Midwest or wherever all together in one gallery. 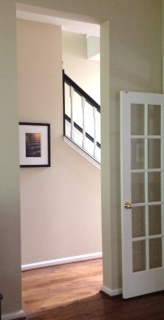 I particularly enjoyed seeing photography hung next to painting rather than off in a side nook somewhere. I enjoyed it also because, like at a party where you meet new people and are delighted to discover you have things in common--who knew? !--I discovered a few artists new to me that I really enjoyed. More about that in a minute. And finally, and most interestingly for me, I watched myself watching, caught myself looking as it were and became curious about what was catching my eye this day. Why was I taking these particular photos with my phone? What was I responding to? What clues might this give me for my own work? Here are some of the pieces I photographed. 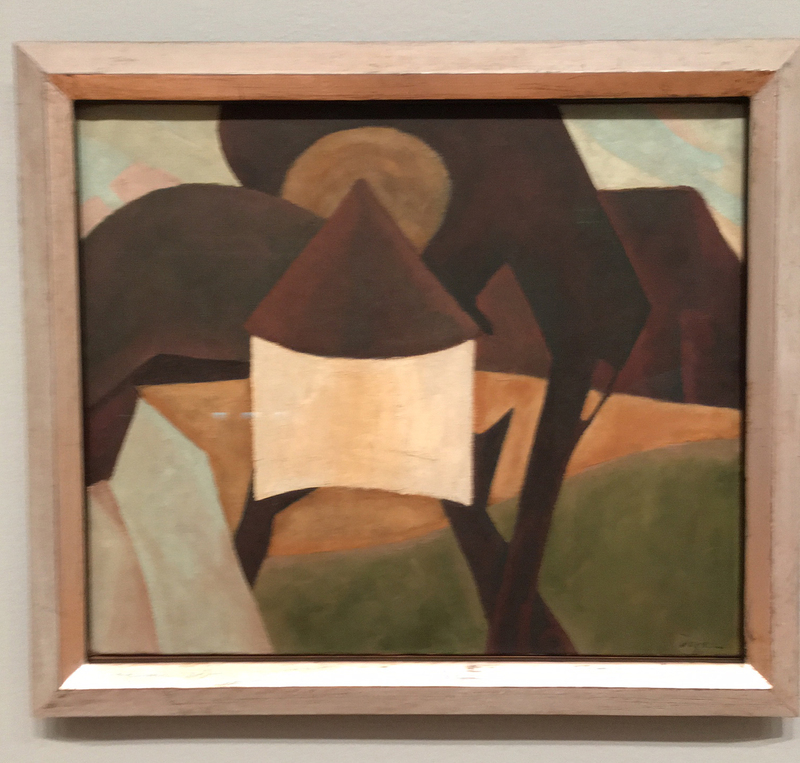 My hands-down favorite was this piece by Georgia O'Keeffe. I think what I love the most about this piece is the detailed pattern of the foundation stones on the right side. The contrast of that small pattern with the broad planes of color in the rest of the piece just seems so eloquent to me. My second favorite details are the delicate white lines of snow above and below the windows. This artist, Dale Nichols, was new to me. I guess I might just be an unreconstructed modernist, because again I am loving the strong graphic, simplified shapes here, and (again) the bright white plane of the building. There is a quality of stillness and silence in these paintings that I really love. I love the absolute simplicity of this print. I had to look twice--I thought it was a drawing or perhaps a relief print or etching at first. (Please disregard the ghostly reflections in the glass--unavoidable.) I wonder, how much courage does it take to work so minimally? 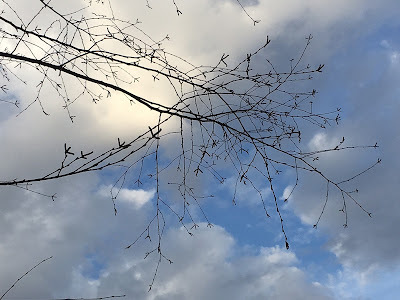 The next day, I saw this on my morning walk. I don't think I would have noticed it at all had I not seen the Callahan the day before. 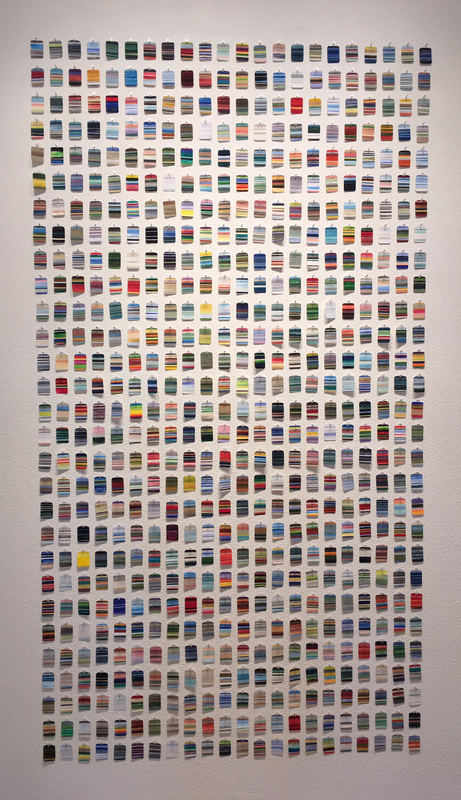 Here's another piece from the show that I mistook for a print at first glance. Again, these strong simple shapes seem so expressive. 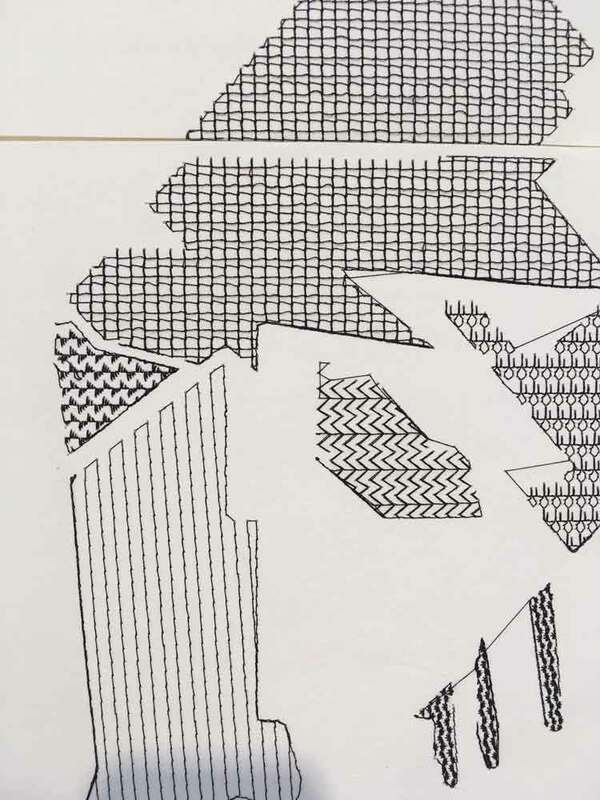 And a textile artist is bound to love all those perpendicular lines. I love running across women artists I hadn't known of before. Carolyn was Andrew Wyeth's sister and obviously a thoughtful and sensitive painter in her own right. 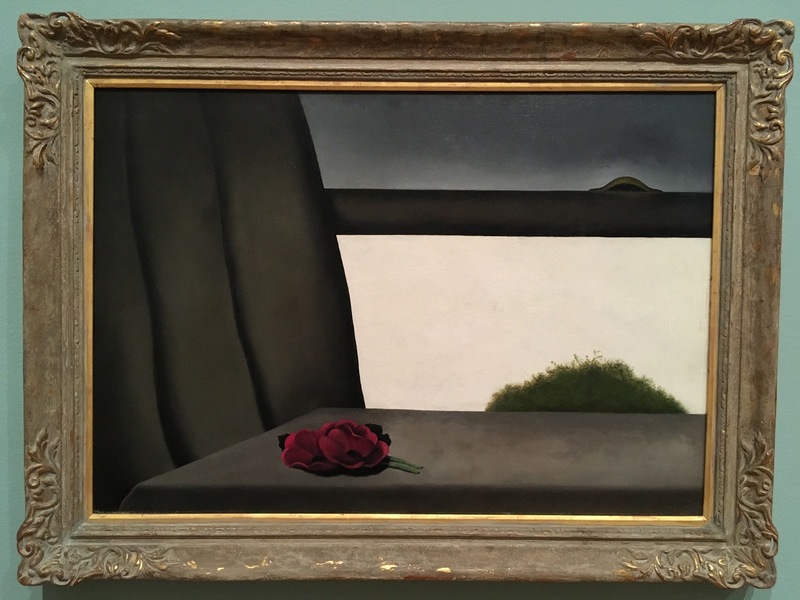 The composition, with its single wilting rose on a ledge or table in front of a window, is unusual and enigmatic. 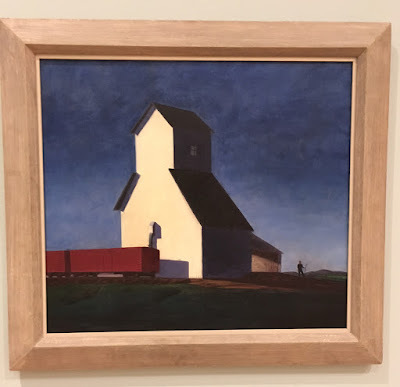 Looking back at the pieces that struck me from this exhibit, it occurs to me it might be a useful exercise to print them out and trace over the main shapes and lines, to see the compositions without the distraction of color and texture. I might learn something about shape, line and proportion. What about you? 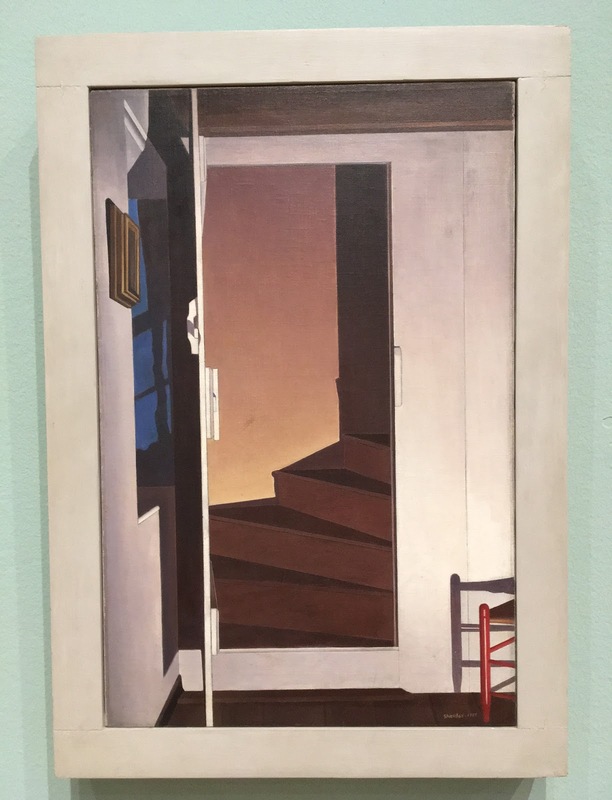 When you see a gallery or museum show, do you find yourself noticing what you notice? You take the high warp, I'll take the low warp . . . If you're a weaver, you know that one sure-fire way to start a spirited discussion is to ask whether warping from the front of the loom or the back is better. Everyone has a definite opinion on this question, and the truth is that both methods are good, depending on circumstances (type of yarn, type of loom, type of weave structure) and what you're used to. 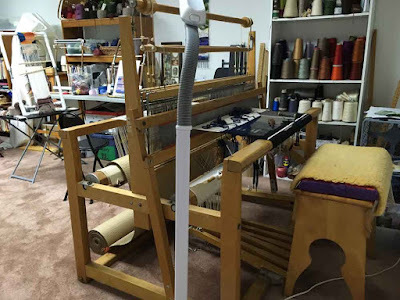 I'm wondering lately if the same is true for tapestry weavers regarding whether weaving on a vertical loom (high warp) or a horizontal (low warp) loom is better. 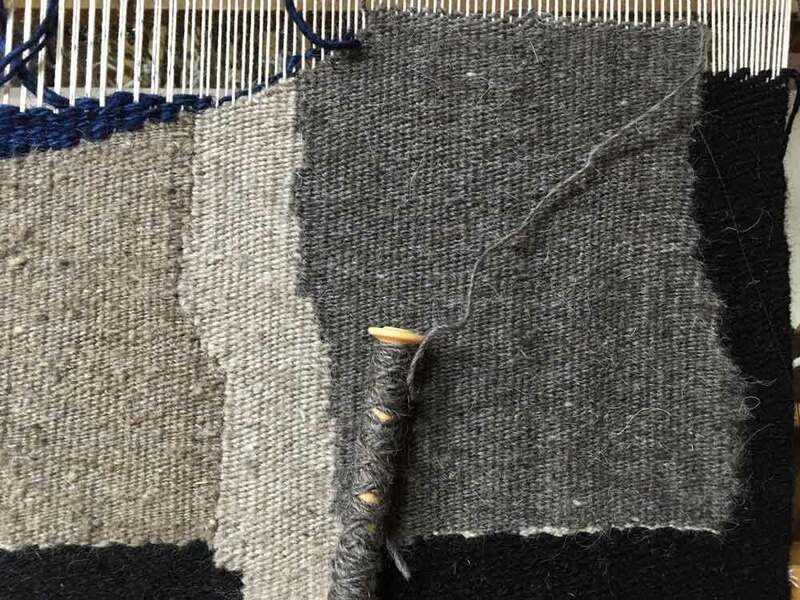 The end results are exactly the same: you can't tell by looking at a finished tapestry what type of loom it was woven on. There are long traditions of excellent work done on each type of loom. Lately I've been weaving on both types of loom and learning first-hand about the differences. 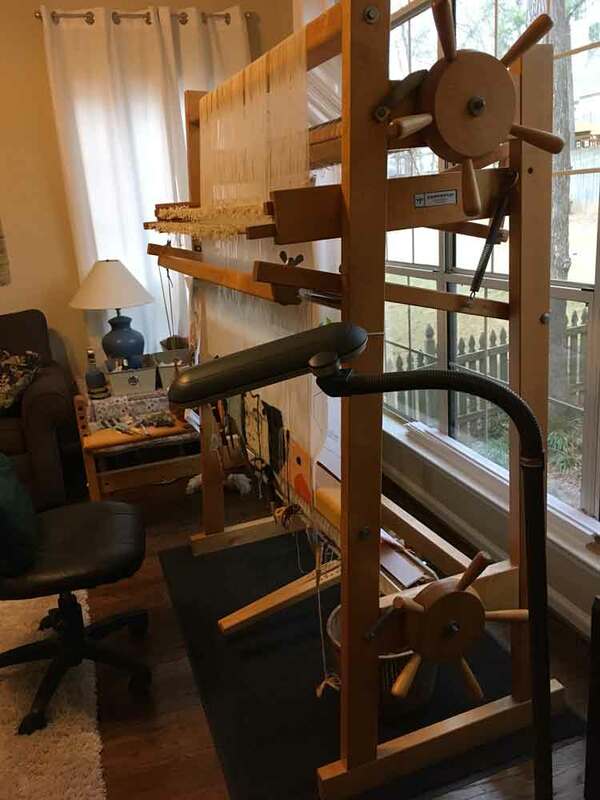 I acquired my first loom, a counterbalance 4-shaft LeClerc Mira, in 2008, specifically because I wanted to learn to weave tapestry and I was assured I could do tapestry on this loom. But I knew nothing about weaving at all, and to learn I took classes from the good folks at the Chattahoochee Handweavers Guild in Atlanta. I fell in love with weaving cloth, making scarves and shawls and baby blankets and for years that was the weaving I focused on using the Mira. But meanwhile I searched for a way to learn tapestry. To my great good fortune, Tommye Scanlin and Pat Williams, two world-class artist-weavers who live right here in Atlanta/north Georgia, offered a weekend workshop. Finally I learned what I needed to get started. I learned on a small copper-pipe loom and eventually upgraded to a Mirrix and then a big Varpapuu rug loom--all of which are vertical looms. 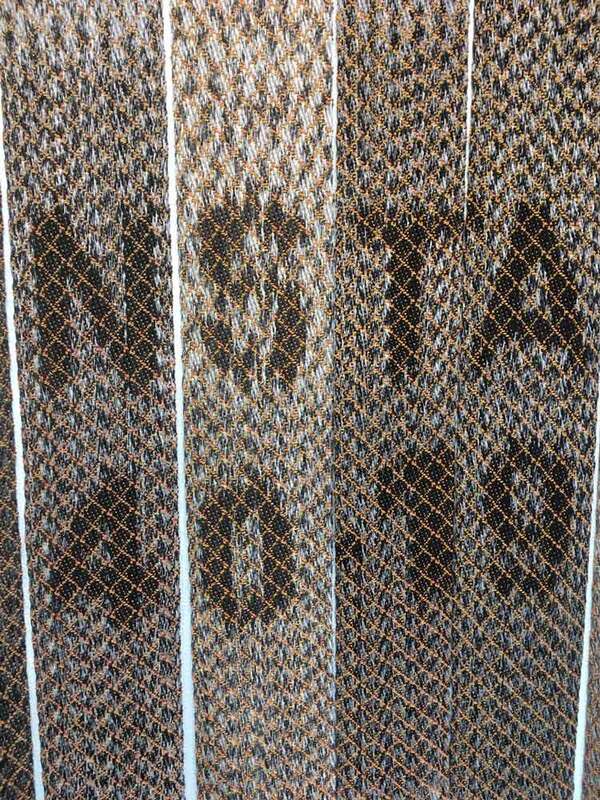 Until now that has been the only way I've woven tapestry. I like being able to see what I'm making right in front of me on a vertical loom, much as a painter does at the easel. Beating in the wefts with the bobbin or fork is easy because you are working with gravity, packing down. It's fairly simple to attach a cartoon behind the warp to follow as you build your shapes and design. And while you don't have to use bobbins to hold your wefts with a vertical loom, I think it helps. And they are such lovely tools, especially the ones made by Milissa Dewey at Bobbin Boy and John and Joy Moss. M3 (working title) in progress, (c) Molly Elkind 2017. Faces are distorted as they wind around the beam. I am just now weaving my first tapestry on my horizontal floor loom. My first loom. That I bought so I could weave tapestry. And I'm shocked to discover how much I'm liking it. For one thing, I use different muscles. Working at the vertical loom stresses my shoulders a good bit, even if I try not to raise my arms too high. It feels more natural to me to let my arms work more at lap level. It also seems easier to sew slits on the floor loom. 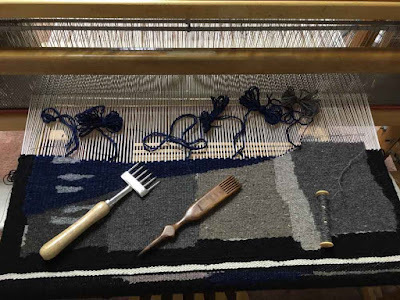 And if you build the tapestry line by line, pick by pick, evenly across the width of the design, you can use the beater to pack the weft. I started working that way on this current project, but eventually my preference for building shapes independently took over, so I'm using a lovely Snipes wooden fork to beat. And sometimes I use this heavy-duty chocolate splitter my friend Terri got for me years ago. Since there's no way to attach a cartoon to a floor loom, if you want to use the beater at all, you have to transfer the design to the warp by inking it on the individual warp strands. I thought it would be a huge hassle to have to ink the warp, but I'm finding I don't mind that too much. It's kind of nice not to have that rattly paper in the way. And I find it easier and faster to make butterflies for my wefts rather than winding bobbins, though I have been experimenting with that. No doubt you more experienced tapestry artists out there have additional thoughts (and probably corrections) to offer. Tell me, which kind of tapestry loom do you prefer, and why? Or do you use both?